The milk shake samples are sure to guarantee long lines at the Sentry Equipment booth during this year’s Hermes Expo in Philadelphia. The booth will be manned by members of the Romarino family, owners of Sentry Equipment, as they demonstrate the latest frozen dessert equipment from Electro Freeze. This will be their first year at the Expo. Sentry Equipment has been a distributor for Electro Freeze since the early 1990s. The partners, Rob Romarino; his father, Bob; and uncle, Andy Crivaro, hope they can convince many of the restaurateurs and other business owners at the Expo that ice cream can be a lucrative profit center for their business. “You don’t have to be an ice cream store to be selling ice cream,” says Rob Romarino. Adding a few feet of space for ice cream sales can add to the profits of restaurants, diners, whatever the business may be. Sentry Equipment is just one of dozens of exhibitors at the Expo, set April 25 at the Arts Ballroom on Locust Street in Center City Philadelphia. The Expo, now in its 27th year, provides a gathering place for Greek American, regional and international business owners to meet, network and create business opportunities and partnerships. When Romarino met Expo creator and organizer Paul Kotrotsios at a trade show, they both realized that Sentry Equipment could help out many of the riceestauranteurs that come to the Expo. Besides a milkshake machine, the family will also demonstrate a soft serve ice cream machine. Romarino hopes it will pique the interest of many of the Greek American entrepreneurs in the room. The atmosphere of the Expo allows them to showcase their products to a large number of people in a short period of time and allows for a quick conversation, Romarino says. If things go well, they can set up a more formal appointment after the show. 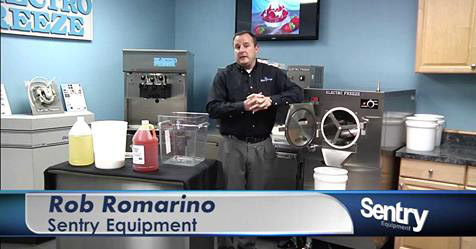 Romarino describes Sentry Equipment as a one-stop shop, handling equipment sales, service, hands-on training and marketing consultations, from equipment layout to menu design. The business covers the Greater Delaware Valley area. It received a Family Business of the Year Award in 2017.